Arsenal signing Mesut Ozil is confident that the club can now give their best account in challenging for the Premier League title. The German international is preparing for his Gunners debut at Sunderland on Saturday after joining from Real Madrid on deadline day and is looking to improve the North London clubs chances of a possible premiership in the near future. The 24 year old said : “I want to play attacking and good football,”. “Attractive football is good but we need to be successful, too. I can’t promise we will win trophies but I can promise we will give our all. “Of course we can challenge for the title. I know the team and I know the talent here. Ozil also suggested that he didn’t earn the respect he deserved at Real Madrid and feels he could be more appreciated at the Emirates Stadium. “That is why I am at the right club. I didn’t get the respect and trust I deserved at Madrid. It was a bit difficult. 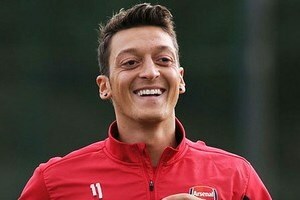 But, when I spoke to Arsene Wenger on the phone, he was full of respect and that was why I came,” he added.